XSo, Im not sure if it's been explained. What's this war all about? And more important, what does it have to do with the main story? Or have we just not got to that part? I've been keeping the war vague, because I'm trying not to load the pages with more info dumps than are necessary, and the war is more a backdrop for the characters than the focus. But the jist of it is their society was some form of feudalism with the Patrizier families on top as the nobility and the lower classes, like Ram belonged to, were all basically serfs. The lower classes eventually revolted, due to the varying shades of horrible that were their lives, bringing about the war. By the end of the chapter everything will be tied back into the main story and explain a few things along the way. So we just haven't gotten into the explaining bit, then, in regards to the relevance. Cool. Though I still can't wait for all the werd dreams to be explained later on... hell, everything to do with Wollen, too. Yay! 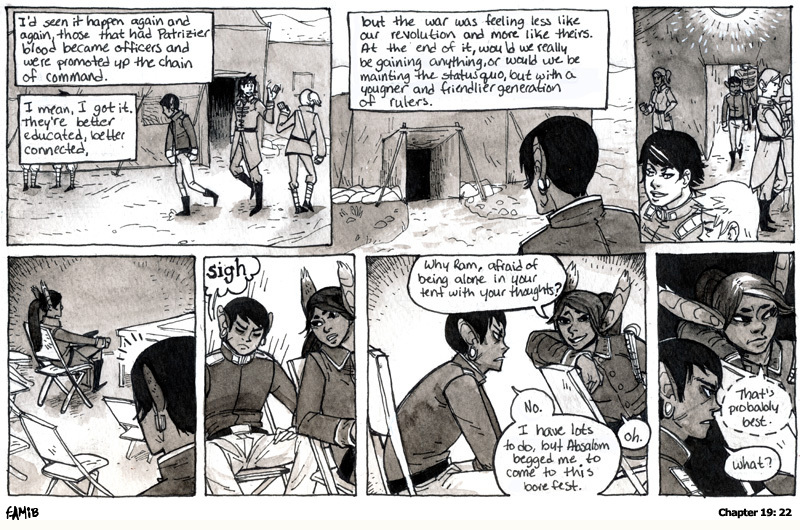 I've been fiddling with the lettering size and spacing in the pages lately. Please let me know if it becomes unreadable for anyone.